Virgin Trains Pendolino 390002 was named Stephen Sutton at Birmingham International on September 15, in recognition of a remarkable young man who touched the hearts and minds of so many. His mother Jane named the '390'. “Stephen was an incredible person, someone from whom we can all learn so much,” commented Phil Cavender, General Manager, Virgin Trains. 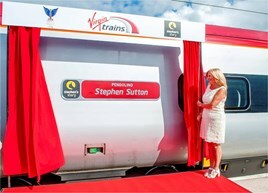 Jane Sutton said: “Standing here today to unveil a nameplate bearing Stephen’s name, on this Virgin Trains Pendolino, makes me an unbelievably proud mum. “Thousands of people will see this train travelling up and down the West Coast Main Line which will only help to reinforce ‘Stephen’s Story’ and remind people of Stephen’s message - ‘to make the most of every opportunity’. Stephen’s Story is a Facebook blog, created by the late Stephen Sutton MBE in January 2013, after he was told his cancer was incurable. Upon hearing the news he decided to create a bucket-list of 46 things he wanted to achieve and posted this list on his Facebook page, Stephen’s Story. Top of the list was to raise £10,000 for Teenage Cancer Trust - a charity he was passionate about as it had supported him throughout his treatment at its three units in Birmingham. Stephen’s Story went viral when he posted what he thought was his last “thumbs up” photo from his hospital bed, on 22 April, 2014. Already an ambassador and major fundraiser for Teenage Cancer Trust, Stephen captured the public's imagination in an overwhelming way in the following weeks. He inspired people across the world to donate to Teenage Cancer Trust, with the total reaching £3 million by the time Stephen passed away on 14th May, 2014. Within a few weeks of his passing, the total had risen to £5million. Since Stephen’s death, Jane has continued to blog via Stephen’ Story, inspiring people to continue their fundraising for Teenage Cancer Trust. In April 2015, Jane fulfilled her promise to Stephen to complete the London Marathon and at the same time raised over £22,500 for Teenage Cancer Trust. Stephen was an inspirational and courageous young man. I'm glad Virgin Trains have named a train in memory of him. Stephen Sutton will always be remembered as a brave, strong man that he has achieved his hobbies and goals whilst he was suffering with Cancer and yes that trains will carry his name in honour of his mother Jane that she is proud to see her son's name on the train. He will always be remembered. Rest in Peace Stephen Sutton.